Abstract. Soil information (e.g., soil texture and porosity) from existing soil datasets over the Tibetan Plateau (TP) is claimed to be inadequate and even inaccurate for determining soil hydraulic properties (SHP) and soil thermal properties (STP), hampering the understanding of the land surface process over TP. As the soil varies across three dominant climate zones (i.e., arid, semi-arid and subhumid) over the TP, the associated SHP and STP are expected to vary correspondingly. To obtain an explicit insight into the soil hydrothermal properties over the TP, in situ and laboratory measurements of over 30 soil property profiles were obtained across the climate zones. Results show that porosity and SHP and STP differ across the climate zones and strongly depend on soil texture. In particular, it is proposed that gravel impact on porosity and SHP and STP are both considered in the arid zone and in deep layers of the semi-arid zone. Parameterization schemes for porosity, SHP and STP are investigated and compared with measurements taken. To determine the SHP, including soil water retention curves (SWRCs) and hydraulic conductivities, the pedotransfer functions (PTFs) developed by Cosby et al. (1984) (for the Clapp–Hornberger model) and the continuous PTFs given by Wösten et al. (1999) (for the Van Genuchten–Mualem model) are recommended. The STP parameterization scheme proposed by Farouki (1981) based on the model of De Vries (1963) performed better across the TP than other schemes. 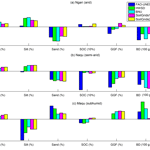 Using the parameterization schemes mentioned above, the uncertainties of five existing regional and global soil datasets and their derived SHP and STP over the TP are quantified through comparison with in situ and laboratory measurements. The measured soil physical properties dataset is available at https://data.4tu.nl/repository/uuid:c712717c-6ac0-47ff-9d58-97f88082ddc0. How to cite: Zhao, H., Zeng, Y., Lv, S., and Su, Z.: Analysis of soil hydraulic and thermal properties for land surface modeling over the Tibetan Plateau, Earth Syst. Sci. Data, 10, 1031-1061, https://doi.org/10.5194/essd-10-1031-2018, 2018. The Tibet-Obs soil properties dataset was compiled based on in situ and laboratory measurements of soil profiles across three climate zones on the Tibetan Plateau. The appropriate parameterization schemes of soil hydraulic and thermal properties were discussed for their applicability in land surface modeling. 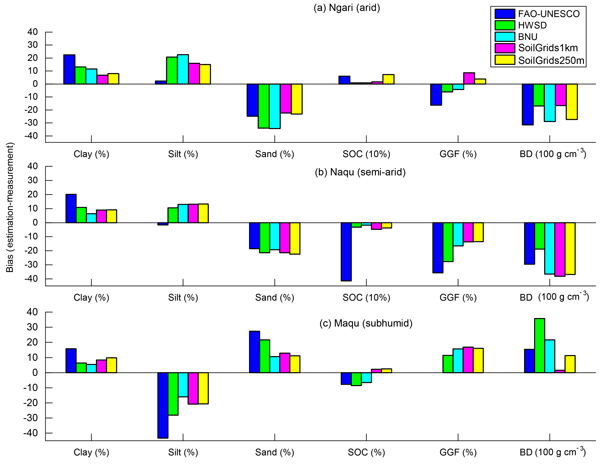 The uncertainties of existing soil datasets were evaluated. This paper contributes to land surface modeling and hydro-climatology communities for their studies of the third pole region.